I’ve been a little lost between all the World Cup games and the NBA Finals (Game 7 tonight! ), but I would be remiss in my golf fandom not to mention that the U.S. Open kicks off at Pebble Beach today out in California. IBM has been a longtime partner with the U.S.G.A. and the U.S. Open, and this year the partnership continues in the digital realm with some exciting new social media capabilities. 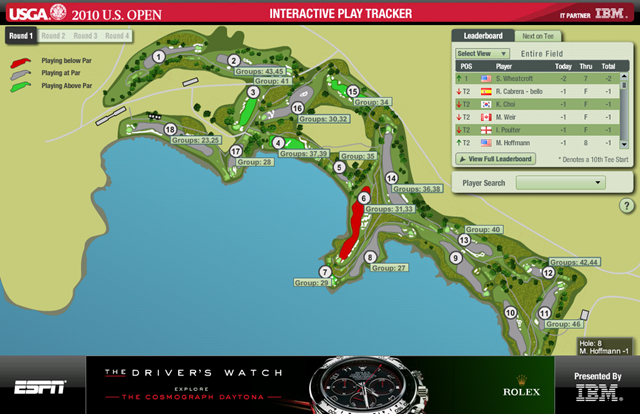 Of course, the home course is the official U.S. Open Website, which is designed and hosted by IBM. This year, IBM players will be helping to integrate a Mixx Channel into the U.S. Open home page. 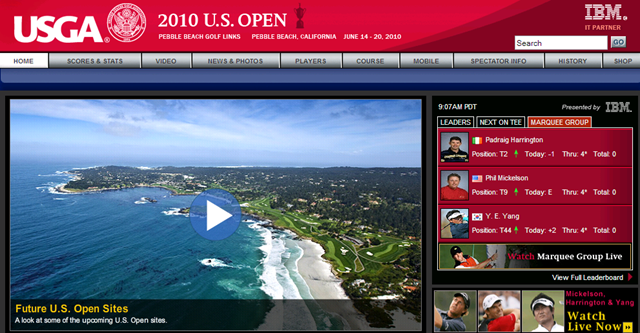 The 2010 U.S. Open Website, built and hosted by IBM on behalf of the U.S.G.A. This will help bring fans (I’m very jealous of all you fans onsite!) attending the tournament into the coverage. Fans who visit the “Experience Tent” at Pebble Beach will be able to provide their own real-time commentary on their Twitter accounts, and the chatter will also appear live on the U.S. Open Mixx channel. Of course, we won’t forget our basic blocking and tackling….err, chipping and putting. There will also be some improvements to the traditional golf leaderboard, including an overview map to enable viewers to ge a birds’-eye view of action on the course. For the non color-blind, there will also be a heat-mapping feature with green, red, and gray indicators to let fans know how hard each part of the course is plahing, with colors differing based on turned in score averages per hole. The U.S.G.A. U.S. Open Interactive Play Tracker gives avid golf fans a nice bird’s-eye overview of who’s hot and who’s not at this year’s U.S. Open. The Website will also feature some HD Live Streaming (including to the iPhone and other mobile browsers), and a U.S. Open Facebook fan page will also share the news. To all mi amigos from the IBM team onsite at Pebble Beach, be sure to give me a shout out if you all need any help out there!